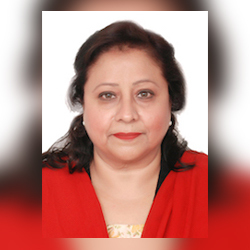 Neena Singh is the Director Client Services covering the India market at Davies & Associates. Fluent in Punjabi and Hindi, Neena lives in New Delhi, India Neena is a non-lawyer who has the exclusive role of ensuring the excellence of our client experience. Neena is highly experienced in working with a wide range of professionals from various industries. She is known for her strong communication skills and an in-depth knowledge of the industry at-large. She is well-liked and admired by her peers for her people skills and dedication to every project she takes on. Having over two decades of experience in client management, her job profile includes client interactions, ensuring client satisfaction, coordinating meetings along with assisting business and investor visa clients. Neena was awarded a distinction for her M.Phil. Degree in History from Punjab University, India. She was also awarded a gold medal for her academic excellence while at the university. Neena is also a strong advocate of philanthropy and champion of our firm's corporate responsibility program. Giving back to the society. She has taken on the educational responsibility of two orphan boys. Apart from social work she has been actively involved as a volunteer since 1995 with Landmark Worldwide, an international personal and professional growth, training and development company, headquartered in San Francisco. During this period her key responsibility was to coach and train individuals, corporate clients and communities.